A Star Wars gift you can't go wrong with: Bandai models and kits – AiPT! These model kits will inspire creativity while looking quite nice on your shelf. As a kid, I loved LEGO — who didn’t, right? I can remember countless hours sitting at my living room table building custom robots and underwater cities. And then Star Wars: Episode I came out when I was around 13. For my birthday that year, instead of going with the obvious LEGO set, my mom took a gamble. When I opened my present I found a model kit of Anakin’s podracer and a few Testers paint and some cheap brushes. I’m sure the look of disappointment and skepticism crossed my face in that moment but it was the beginning of hobby that would come in and out of my life to this day. I didn’t have little blocks that I plugged into each other, but there were small pieces that I attached via glue. I couldn’t make whatever my heart desires, but it WAS Star Wars, so who the hell cares? I may have different feelings about the movie now, but as a 13 year old, Episode I rocked and so did podracing! Besides, if all went well, this model was going to look just like the real thing. It was a new way to challenge myself. I gave it all my little boy heart could and well the end product… kinda sucked. I like to imagine this is how it turned out. I had no idea what I was doing. I think I glued the whole thing together before I even considered painting it (that was the LEGO builder in me). I was a super impatient kid, so I wanted to finish the whole thing in as few sittings as I could. While trying to paint one part, I attempted to paint the next before letting the first dry, getting it all over my hands and the rest of the model in the process. When I said it kinda sucked, it was definitely a hot piece of garbage, but I was proud of it because I completed it. It even sat on my shelf for quite a while before eventually breaking from too much handling. My next project was a TIE fighter which was a bit easier because it didn’t have flimsy pieces and was mostly one color. One thing I remember enjoying was mixing blue and black to get that distinct TIE fighter shade. I had learned a little from my first attempt and my second came out a bit better. That was the last Star Wars model I would do for quite a while, but I went on to try my luck with trucks, tanks and planes. I dropped the hobby after a couple of years, because girls and stuff, I’m sure. Over ten years later around the time The Force Awakens was released, I came across a Millennium Falcon Bandai Kit. This was about the same time Disney released a Millennium Falcon Lego set which I so desperately wanted but didn’t want to drop $150+ for. The kit was much more reasonable at a cool $30 from Amazon. After a $20 air gun, a little paint and much more patience than I had years ago, I spent weeks putting this thing together. With a little help from the internet, I applied a few basic techniques and my latest attempt was much more successful. It really ties together the family photos. Not only are these kits cheap, but you don’t even have to go to the lengths I did. Most of these models come out of the box molded in the appropriate color. After you apply the supplied decals, they are fairly detailed without much effort. You don’t even need glue, as they are designed to be predominantly snapped together…just like LEGO! For example, Slave 1 has five different colors and 23 decals. To be honest, I don’t even consider picking up LEGOs anymore (not that I should, considering I’m in my thirties). They are neat and I get excited when I see a completed set in a mall window, but I like the realistic, detailed look the model kits offer. 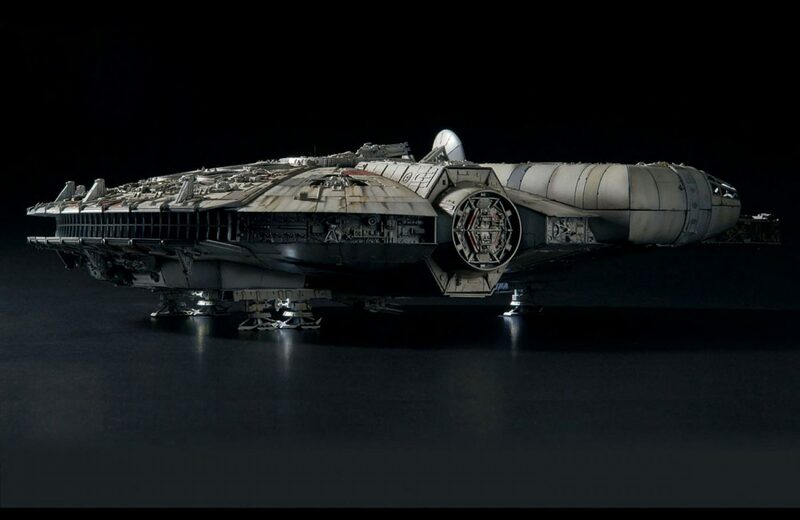 It’s not a blocky version of the fastest hunk of junk in the galaxy, it IS the fastest hunk of junk in the galaxy, just 1/144th the size. LEGOs are still awesome and I have all of the ones I collected as a kid, but I feel I’ve found something that fits my style more. You too could recreate the moment Han was loaded into Slave 1 after being frozen in carbonite! I think giving one of these Bandai model kits as a stocking stuffer is a great gift for any Star Wars fan, and you might just spur a passion someone never knew they had. Just recently I managed to pick up an A-Wing at my local book store on sale for a little under $20. It’s a very inexpensive introduction to the world of model making and makes a nice display on a book shelf or desk. It builds on concentration, patience and forethought while giving one a sense of accomplishment in the end (no loot boxes required! ).